My year as the 2015 Natalie Miller Fellow has been one of incredible growth both professionally and personally. In a business sense it has opened so many doors. I continue to be contacted by industry colleagues, both women and men, to not only to congratulate but also to engage and collaborate. In turn, it has allowed me to reach out to business leaders for guidance and partnership. The alchemic timing of receiving the Fellowship whilst in the start up phase of my new business, Goodship, provided incredible momentum. My visit to the USA and Canada in April 2016 to meet with leading film and social impact practitioners and to attend the Tribeca Film Festival and the Hot Docs Film Festival Forum was immersive, reflective and inspiring. It cemented some of my new business’ objectives, helped articulate others and exposed me to female business leaders and creatives achieving incredible things. In a personal sense it has been a period of incredible highs and peaks of confidence, but also of self-doubt, often questioning why I have chosen to take on the considerable challenge of starting my own business at one of the most intense chapters of my life parenting twin toddlers. But the reality is I had to, because there are limited options on the table for women who want, and need, to parent and work. Applying for the Fellowship made me face these realities; winning the Fellowship made me punch through the sleep deprivation to keep going; and being a Fellow has alleviated the isolation that I, and I know many other women, feel in this period of their career. It provided the sisterhood I never knew I needed nor was there. The significance of the presentation of my Fellowship taking place in the opening session of the Australian Movie Convention before the industry’s top executives was not lost on me. It demonstrated the acceptance and enthusiasm the industry has for important conversations about encouraging a new generation of women to become leaders across all areas of the industry. I attended the Tribeca Disruptive Innovation Awards celebrating ground breaking innovation across the full spectrum of traditional and non-traditional domains ranging from technology, film, biomed, politics, education, healthcare, spirituality, religion, economics, sports, fashion and philanthropy. Honorees who attended included Hamilton creator Lin Manuel Miranda, Civil Liberty Defender Anthony D. Romero, Edward Snowden (who appeared live from a top-secret location in Who Knows Where, Russia, through a mobile BeamBot robot), paleoanthropologist Richard Leakey and futurist Alec Ross who led a fascinating seminar about the intersection of science, technology and humanitarian arts in future industries. Funding Media for Change: led by author and change agent Tracey Friesen exploring that given the right partnerships, media can impact hearts, minds, behaviours and public policy. Branded Docs Workshop with Brian Newman, Founder of production, distribution and marketing company Sub-Genre discussing how working with brands can increase the impact and reach of their films. Online Channel Surfing Forum featuring leading digital network executives from The Guardian Documentaries, New York Times Op-Docs and VICE Channel to discuss the programs that make their brand, the viewers they target and the deals they make. So You Want to Be an Impact Producer Workshop led by Darcy Heusel, Senior Vice President of Impact Campaigns, Picture Motion and Ellen Schneider, Founder, Active Voice Lab. Back in Australia over the course of the year I had the privilege of meeting with inspiring female business leaders including Deanne Weir – Foxtel, Jenni Tosi – Film Victoria, Fiona Cameron – Screen Australia, Jane Sloane – Global Fund for Women, Julie Reilly – Australian Women Donors Network and Melissa Silverstein – Women and Hollywood. I will continue pursuing mentorship programs with female business leaders aligned with the philanthropic, social enterprise, branding and/or corporate sectors to glean business and leadership skills. 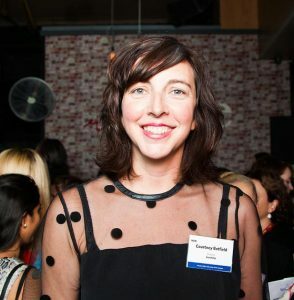 In July 2016 Goodship was announced as one of 13 industry recipients of the inaugural Screen Australian Gender Matters Brilliant Careers program. This allowed Goodship to appoint a Brand Integration Specialist to marry brands and corporates with socially conscious screen content. Being a part-time senior position, we were able to employ an incredibly experienced working mother, very much in line with our philosophy of forging job opportunities and workplace flexibility for women. In mid 2016 I was accepted into the BT Social Entrepreneurs Accelerator Program run by the School For Social Entrepreneurs (SSE) after a competitive application process. The incubator program was ideated to transform Australia’s next group of change-making social enterprises. Unfortunately just prior to the program starting the SSE closed its Australian operation, although there are still opportunities to connect with some of the companies that were involved. In September 2015 I was invited to present an Impact Producing, Marketing and Distribution Masterclass at the NZ Big Screen Symposium – the annual gathering of the NZ film industry. My presentation offered insights and case studies on building strategic philanthropic and brand partnerships for films, across both documentary and drama. In summary, my time as the 2015 Natalie Miller Fellow saw me journey from fledgling entrepreneur, to meeting with leading film executives in Manhattan, to teaching a masterclass at an international film symposium – things I never thought I could achieve. The opportunities the Fellowship will continue to afford me in my professional ventures are boundless and I look forward to continue promoting the NMF however possible and meeting with future NMF Fellows. Thank you to Natalie Miller, Sue Maslin, Chrissy Thomson, the NMF selection panel and the NMF Committee for allowing me this incredible experience.